On Friday night, we decided to go get something to eat. 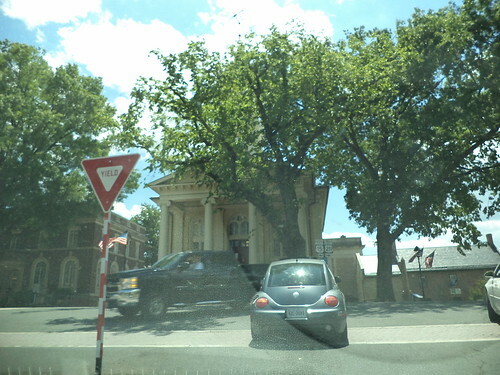 Carole had driven me through downtown Warrenton, which wasn't as spectacular as I expected. I admit to having preconceived notions of what the downtown of an early 19th century town might look like. There would be lovingly preserved buildings, which there are. There would be stores which have been there for a long time, probably true. But there were a lot of offices and not many restaurants. There weren't many shops. It's not a downtown for parking and wandering. This is a product of the location and how the roads have to come into and go through downtown. The city is built on rolling hills. This makes it quite picturesque. Owning to the city's age, homes and businesses are built very close to the road. It's a remnant of the time period of founding. Wide front yards just aren't that common. The road has to wind through the town, following the trail which was laid out in the years after the war of 1812. The downtown is a slight mishmash of roads and directions and not four-way stops. There are a few things to see, some eclectic and the buildings make for a lovely visage, but for tourists, it's not a downtown for them. So, in deciding where to go for supper, we went out to the main drag, which is the highway that loops around the southeast side of the city. That's where the big box stores with their attendant strip malls have landed. We wound up at a place called El Agave. It's in a strip mall near the branch of SunTrust Bank where Carole works. 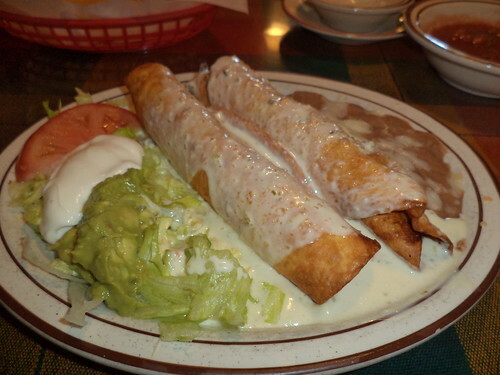 That is two chicken chimichangas with refried beans, lettuce, sour cream, guacamole and a tomato. It's topped with shredded cheese and fried. I run hot and cold on Mexican food. I don't care for tomatoes although I do love tomato soup and sauce. I don't care for guacamole or onions or sour cream although I use sour cream in cooking. These were soooo good. Mexican food can come in huge portions but this was just enough. Yes, we had chips and salsa. Their chips could have been from a bag but the salsa looked homemade. I would heartily recommend this place to anyone in the area. It's really good and reasonably priced. 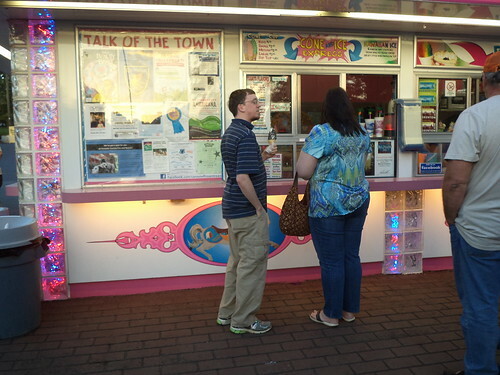 From there, we went to a Warrenton institution, Carousel. Every town should have one of these. Larry said the store started in the 1980's. It used to be just a truck that would park at this intersection during the summer. (It's very easy to find. Take highway 29 into town. Where 29 intersects with 211, turn left. It's right there, adjacent to a strip mall where there's ample parking.) Eventually, they built the permanent structure which is open until Thanksgiving-ish. They reopen for the week of spring break, and then open for the summer around the middle of May. He said the original owners still own the place and still work it. There were a lot of teens manning the windows and I'm thinking Carousel gave a lot of teenagers their first job. 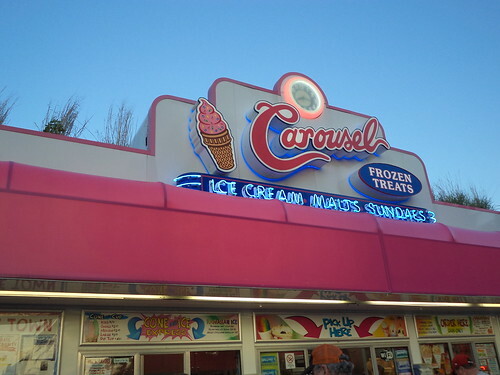 They do have a "lunch" menu with sandwiches but you go to Carousel for ice cream. When we were there on Friday, the line for full-service was 25 people long. They have a window for ordering just ice cream cones. So many flavors. All the ice cream is soft serve. I never knew soft serve could come in root beer flavor. Larry got a vanilla cone with chocolate sprinkles. 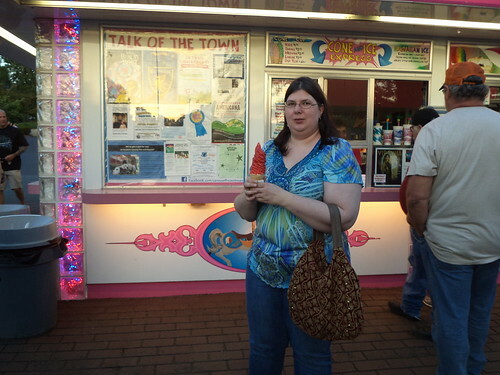 I got a chocolate dipped cone and Carole got a cherry dip. There is a lot of outdoor seating around the place, but when we were there, it was all filled so we retreated to the car to eat. 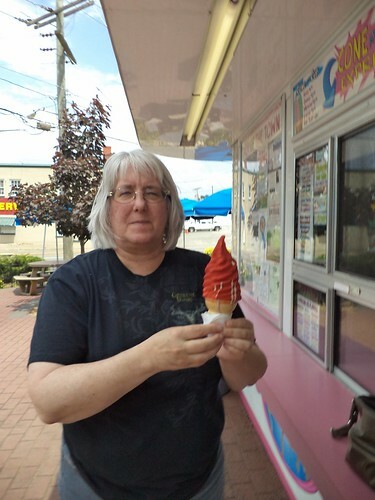 It was so good, Carole and I stopped by on Tuesday afternoon, on the way back from our adventure and I got the cherry dipped cone. The place just exudes happiness. The pink and blue and red neon of the trim just makes you feel happy. I half expected Pharrell Williams to jump up singing "Happy". You can tell the community is hugely supportive of this, too. The "Talk of the Town" bulletin board behind Carole had listings for all sorts of community and area wide events from concerts and plays to flea markets and festivals. It's probably a good thing I don't live out that way. I'd have to sample everything.